When it comes to extracurricular activities, I'm a pretty laid-back mom. I want my kids to explore their interests and try new things, but I also think at their age it's just as important to have fun. I have never demanded they participate in anything—except for swim classes. From the time my kids were babies, I've had them in some sort of swim class. I started with one of those classes where you hold your baby (who's wearing a swim diaper that you pray will be up to the job), twirl them around in the water, sing some songs and call it a day. When they were about two, I started focusing on the actual swimming part. We began with group classes at the Y, which they loved. In these classes, they played games and splashed around the shallow end under a big plastic tree that sprayed water. My kids couldn't wait to go to the pool, but they still didn't know how to swim, which is a stressful stage to be in. Going to the beach with kids who are adventurous and love the water but don't even know how to float is not a good time for any mother. When my kids were about four years old, we moved on from the Y and started taking group swim lessons at the local community center. These were, unfortunately, not as helpful as I had hoped. 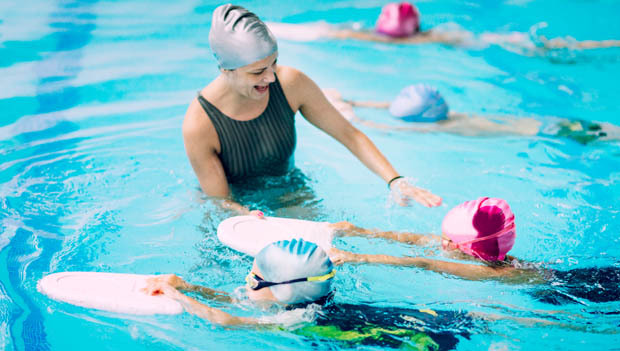 When you have twelve four-year-olds and one overwhelmed swim teacher, you get eleven kids lined up on the side of the pool fooling around while the twelfth gets their 30 seconds blowing bubbles in the water with the instructor. Again, my kids had fun, but they still didn't learn how to swim. Then came the near-drowning incident.